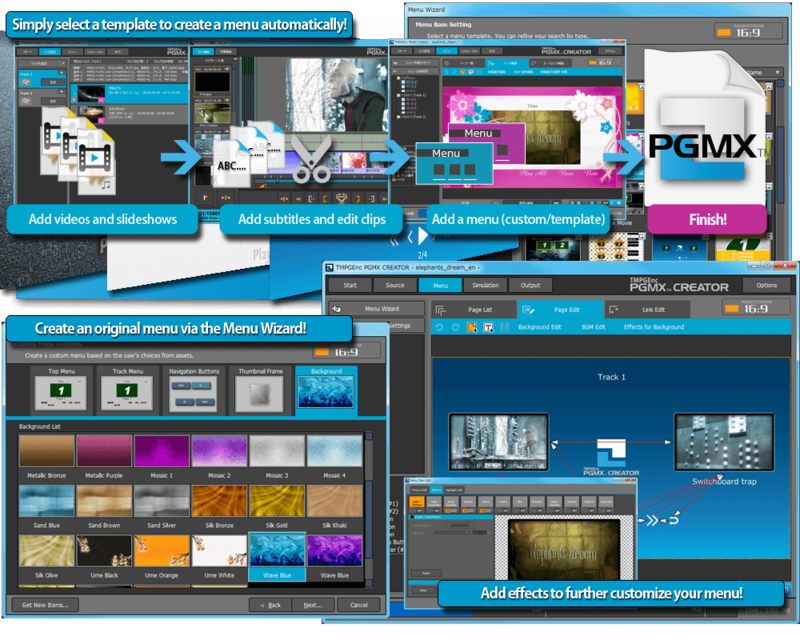 TMPGEnc PGMX™ CREATOR - Video, Subtitles, Slideshows and Menus, all in one file. DVD & Blu-ray Is the Past, PGMX Is the Future. One File Includes Video, Menus, Slideshows, Subtitles and Audio. Introducing PGMX, a next generation original Pegasys file format that can store menu, video data and more in a single file. Create DVD / Blu-ray styled navigation menus, add a photo slideshow, subtitles, multiple audio streams and more without the limitations of physical media discs. TMPGEnc PGMX CREATOR allows you to do it all with an easy to use interface that allows you to create custom menus or use pre-made templates. Smart rendering (lossless editing) and support for many types of video files make it easy to start creating PGMX files. Born to Overcome Limitations of Current Formats. At Pegasys, we have been developing DVD and Blu-ray authoring software for many years. It has been over 20 years since DVD-Video attained widespread adoption, and since then personal computers have advanced in capacity and power but there is still no widespread video menu format other than DVD-Video and Blu-ray. However, those formats mostly rely on physical media and a drive capable of playing and writing to such media. Because of this limitation, capacity is limited which can also affect video quality, not to mention the time it takes to write data to disc media. With those limitations in mind, we set out to create software with a new format that makes it possible to create content as freely as possible which is easily portable and easy to watch. Thus, TMPGEnc PGMX CREATOR and the proprietary format, PGMX, were born. What Is the PGMX Format? PGMX is short for Pegasys Multimedia Box. Developed by Pegasys, it can store both menu and video content into a single file (.pgmx / .mkv). The video stream is H.264/AVC, and since the file does not depend on physical media such as DVD and Blu-ray discs, it is not limited to certain video characteristics. For example, you can use MP4 video from your smartphone which typically may not be DVD or Blu-ray compliant, or you can even use videos in 4K resolution (4096×2304). PGMX files give you the freedom to keep your videos at a quality level and resolution of your choosing. PGMX files can also utilize a navigational menu system that can link to multiple videos within the file. Since both the menu and videos are combined into one file, there is no complex folder structure like those found in the DVD-Video and Blu-ray formats. Having everything in just one file makes it easy to use, copy and transport. PGMX files are playable with our free software, TMPGEnc PGMX PLAYER, allowing you to easily play your file on nearly any PC. Once you create your PGMX file with TMPGEnc PGMX CREATOR, play it immediately with TMPGEnc PGMX PLAYER, and enjoy videos with menu navigation instantly. Menu navigation works similar to DVDs so anyone can enjoy PGMX files, even if they don't have TMPGEnc PGMX CREATOR software. Creating PGMX Files Is Easy, Even for Beginners. Creating a PGMX file in TMPGEnc PGMX CREATOR is easy. Just follow the on-screen instructions that guide you through the creation wizard. 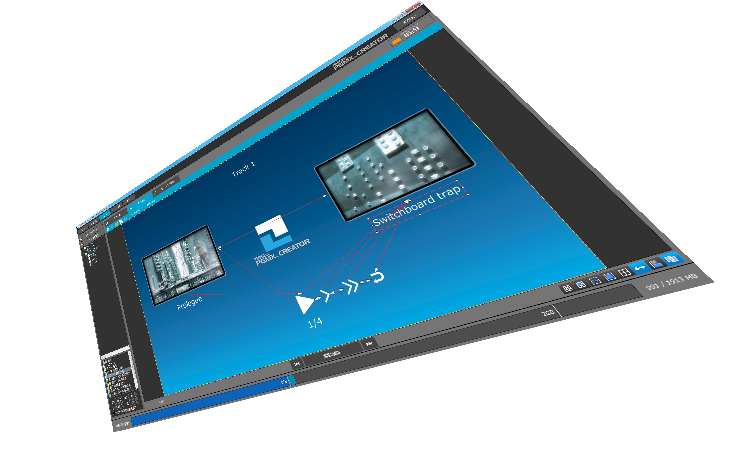 The intuitive interface allows you to edit your video, add chapters, or even add subtitles with no difficulty at all. Templates are supplied for menu creation, so even if you don't know anything about menu design, you can build a good-looking menu quickly and easily. Create a Complete PGMX Menu in 5 Seconds. TMPGEnc PGMX CREATOR features an easy-to-use menu creation tool that allows you to create a menu even if you're a beginner. Simply select your favorite menu template and follow the instructions to complete your menu. You can complete a menu in as little as 5 seconds since the title and chapter names in your menu are taken automatically from the clip editing data. Of course, you can customize the menu if you wish by adding new elements, buttons and backgrounds, or editing the titles and chapter names. There is also a custom menu mode, where you can build the menu from the ground up, instead of using a template. Since the PGMX format is not dependent on a specific standard, it is possible to create an original menu without worrying about the resolution or aspect ratio. For example, you can create a menu with non-standard dimensions like 1000 × 2000 pixels. 1000 (horizontal × 2000 (vertical) demo video. Thumbnail highlights can be masked to match the visible part of the thumbnail. Perfect for menu designs with elements overlaid on top of thumbnails. High-Speed, High-Quality Output with Smart Rendering. If the video / audio format conforms to the PGMX file format, the video can be output using smart rendering. Smart rendering allows the video/audio to remain mostly untouched during output, thereby avoiding re-encoding which could result in a loss of quality. Only the points during the video that were edited are re-encoded; all unchanged parts remain untouched. By not encoding the entire video file, output is extremely fast and quality remains as the original level. Apply transition effects between photos in a slideshow or between video clips. There are over 170 transition effects to choose from, ensuring that you can add your own unique touch to your videos and photos. Add up to eight closed caption or subtitle streams (such as from a DVD / Blu-ray, etc. ), and up to four audio streams. Even with multiple audio and subtitle streams, only one file will be output; no more hassling with complicated file structures. The PGMX format also supports text subtitles, the display of which can be adjusted from the PGMX PLAYER software. For instance, you can change the font, size or layout from the player without editing the file. Equipped with the x264 Video Encoder. TMPGEnc PGMX CREATOR uses the x264 high-quality encoding engine. This renowned encoder is used all around the world and has been adopted as the H.264/AVC encoder for sites such as Facebook and YouTube. The video know-how of Pegasys combined with the high-quality x264 encoder will bring you peace of mind that your videos will look their best. 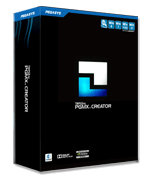 TMPGEnc PGMX CREATOR comes with an easy-to-use, high-speed cut editor for editing your video clips. Simply select an unwanted range and click the "scissors" button to cut that section from your clip. You can also simply split a clip into multiple clips. The high-speed thumbnail navigation allows you to breeze through your footage to quickly find scenes to edit. You can pre-register multiple projects in the batch tool, allowing you to output multiple projects at once. Some projects may require a lot of time to output because of complex menus, HD video, or video that needs to be re-encoded, or, perhaps your PC isn't that powerful. The batch tool lets you work on multiple projects, and then output them one after the other while you work on other things. TMPGEnc PGMX CREATOR isn't just for video. You can create your own photo slideshow by simply specifying a folder or a group of photos. It's a great way to create digital photo books of memorable events such as a vacation, graduation, or wedding. And because PGMX files are a single, easy to transport file, it's easy to copy it to a thumbdrive or share it via the Internet to friends and family. Create Your Own Menu Parts! In case one of the pre-defined templates or menu parts aren't exactly what you need, you can always create your own with the menu part creation tool. The tool guides you through the process of making your own menu parts such as buttons, thumbnail frames, and backgrounds. You can even utilize Photoshop (.psd) files and layers to create menu parts. High-speed Decoding & Encoding with NVIDIA® CUDA™ or Intel® Media SDK (QSV) hardware. Intel® Media SDK (Quick Sync Video) and NVIDIA® CUDA™ hardware is supported, allowing for hardware decoding and encoding of H.264 video, allowing for potential speed gains. It is especially effective for HD video. *Please note that the CUDA Encoder cannot be used in the NVIDIA Graphic Driver Ver.340.52 WHQL, 340.43 BETA or newer version installed environment. *Requires Intel Media SDK or NVIDIA CUDA hardware. PGMX / MPEG-TS File Title Selection Import. Upon analysis, and to the best extent possible, you can display and select the content of a PGMX / MPEG-2 TS file consisting of several video files (more than one video, audio or subtitle stream) or where the resolution changes. *Copy-protected or encrypted files cannot be imported. * Video/audio formats not supported by TMPGEnc PGMX CREATOR cannot be read. Allows you to easily adjust the size of the output file. By using the gauge at the bottom of the application's window you can verify the output size at any time, and correct the size while editing. *The displayed output size is an estimated indication, the actual output size may be different. Plus even more high-performance features. There is compatible with the MKV file container structure in the basic PGMX file. You can use the following methods to output a compatible MKV file. There should only be one (1) track. If your file has multiple tracks, only the first one will play in non-PGMX players. Menus will not display in non-PGMX players. If you want to be able to view subtitles in non-PGMX players, make sure to select the plain text subtitles option in the subtitles output settings. Image-based subtitles cannot be displayed in non-PGMX players. I want to change to ".mkv" output extension. * In the output file according to the above, it does not guarantee playback on all players. *Use of the product in a virtual desktop environment, virtual OS, virtual PC, or any other emulator environment is not supported. Environment DirectX 9c or later installed. CPU Intel Core i7 2.66 GHz or parallel processing capable CPU. Functions faster with a multi-core, AVX2 instructions-equiped CPU. *Other CPU than those listed above are acceptable provided they support the SSE2 instruction set and use an higher working frequency. ** This software may not function properly in environments where the memory is only 1GB and shared with an integrated graphic processor. In such a case, a warning may display at launch. This software cannot be used with computers having only 512 MB of available memory (ex: memory shared with the video processor). In this case, increasing the amount of memory may fix such issue. Refer to your computer's documentation and/or contact your computer vendor for more information regarding memory extension. *** A FAT32 formated hard disk drive (HDD) does not support a file size higher than 4 GB. Preferably, output your file to an NTFS partition. If you are using a FAT32 formated HDD or external disk, it may be possible to convert it into NTFS format. Refer to your device's user manual or contact the device maker. Also refer to your computer, editing software, encoding software, writing software, and capture device's User Manual. Do not infringe on copyright laws. xbyak - Copyright (c) 2007 MITSUNARI Shigeo. All rights reserved. WebM - Copyright (c) 2010, Google Inc. All rights reserved. No effort has been made to include ™ or ® marks.